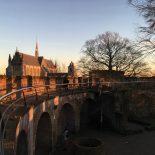 Hello and welcome to The Leidener, a blog by international students at Leiden University and Leiden University College: The Hague. We want The Leidener to be your window into student life here; a chance for us to give you a taster of what studying in Leiden/The Hague is like. The Leidener has bloggers of many different nationalities and on many different courses, and so there is a wide variety of content which you can browse to find something which particularly interests you. If you have any questions, feel free to comment on the blog posts or contact us directly. If you want to become a Leidener and blog with us, contact us! We hope you enjoy the blog, and maybe we’ll see you in Leiden in the future! Alain Hajjar From Lebanon how can i apply for PHD degree or Masters?